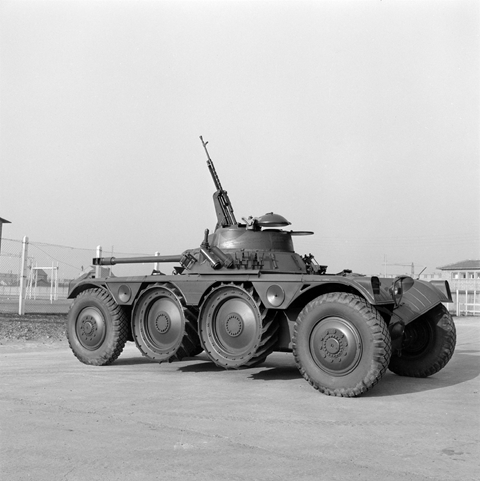 Four years after the development of the specifications for the new armoured reconnaissance vehicle (EBR) which was to equip the French army after the Second World War, the military staff accepted Panhard's proposal. The innovative concept of this machine was attractive in its departure from the existing system. Thanks to studies already carried out in 1938 by the Delagarde-Géry team on the AM 201, the EBR presented clear advances. To keep the profile as low as possible, the engine was mounted flat in the centre of the vehicle. Based on the Dyna car's two-cylinder engine, it had twelve cylinders and was air-cooled. This was the famous Panhard 12-H-6000 S 250 hp engine, making this armoured vehicle the fastest of its time (115 km/h in both directions). 1174 EBR vehicles were built and exported to several countries, establishing the reputation of the Panhard brand in the field of military vehicles.